The modern human’s face was shaped by the need for good social skills, according to new research. It’s extraordinarily expressive features boosted our early ancestors’ ability to communicate, say scientists. This explains the flatter appearance compared to close relatives such as Neanderthals, bonobos and chimanzees. We have small noses and our jaws sit beneath the rest of our skull. Our cheek bones are angled and each has a distinctive hollow beneath the eye socket. By comparison the Neanderthal face was huge – with an enormous nose and the front of the face pulled forward. Around the cheeks the skull curved outwards – rather than being hollowed out. To our eyes, this would have given them a puffy appearance. They also had a far flatter forehead than we do – while above their eyes was a pronounced double arch of the brow-ridge that hung over the rest of their face. It was thought these differences were mainly fuelled by diet and climate change – but living in groups was just as important, the study found. In the most thorough analysis of its kind it reviewed all the available fossil evidence to map the human face from early African hominins 4.4 million years ago to today’s human. This showed it evolved to provide more opportunities for gesture and non-verbal communication – as well as the other environmental factors. These were vital skills for establishing the large social networks that helped Homo sapiens survive. Professor of anatomy Paul O’Higgins at the Hull York Medical School and the department of archaeology at York University, said: “We can now use our faces to signal more than 20 different categories of emotion via the contraction or relaxation of muscles. As large-brained, short-faced hominins we look nothing like our extinct Neanderthal cousins or our closest living relatives – bonobos and chimpanzees. Now the study published in Nature Ecology and Evolution has shed fresh light on a mystery that has baffled experts for decades. Human faces convey a huge range of emotion and information through subtle shifts in the muscles around our eyes and mouth. No other animal has such an expressive face. What’s more, each of us can instantly recognise another member of our species with a glance at their face. No other species shares our flat face, high forehead, small jaw and jutting chin – not even the many human-like species that went before us. 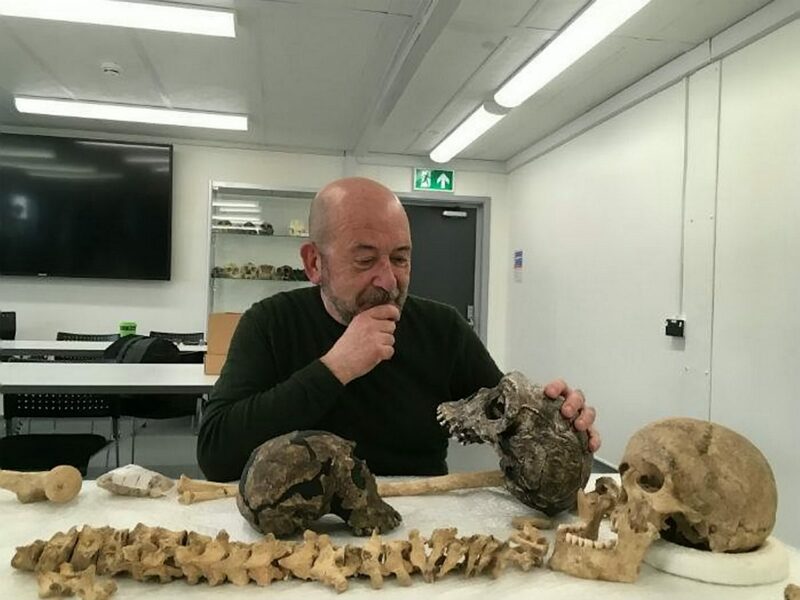 Prof O’Higgins’ international team have helped unravel the reason by analysing the remains of prehistoric hominins and modern humans using 3D computer models. They say social communication has been somewhat overlooked in the development of the human facial form. It should be seen as the result of a combination of biomechanical, physiological and social influences, they say. This explains the smooth forehead with more visible, hairy eyebrows capable of a range of movements – instead of the pronounced brow ridge of other hominins. This, alongside our faces becoming more slender, allows us to express many subtle emotions – including recognition and sympathy. Prof O’Higgins said: “We know other factors such as diet, respiratory physiology and climate have contributed to the shape of the modern human face. Our face has partly been shaped by the mechanical demands of feeding. In the past 100,000 years it’s got smaller. This has been caused by our ability to cook and process food – lead ingto a reduced need for chewing. This facial shrinking process has become particularly marked since the agricultural revolution. We switched from being hunter gatherers to farmers and then to living in cities – lifestyles that resulted in increasingly pre-processed foods and less physical effort. Prof O’Higgins said: “Softer modern diets and industrialised societies may mean the human face continues to decrease in size. “There are limits on how much the human face can change however – for example breathing requires a sufficiently large nasal cavity.